When I posted a picture of this recipe on the @ChocolateCoveredKatie Instagram page last week, people went crazy! In less than 24 hours, the post had already gotten almost 4,000 likes and over a hundred comments – I couldn’t respond to the comments fast enough! It was hard to keep this recipe secret, but I wanted to first give it a test run at a Super Bowl party last night. The test run went even better than I’d hoped, with 6 requests for the recipe and TWO batches of these bars completely gone by halftime! I can tell you with confidence this recipe is definitely non-health-food-eater approved!!! 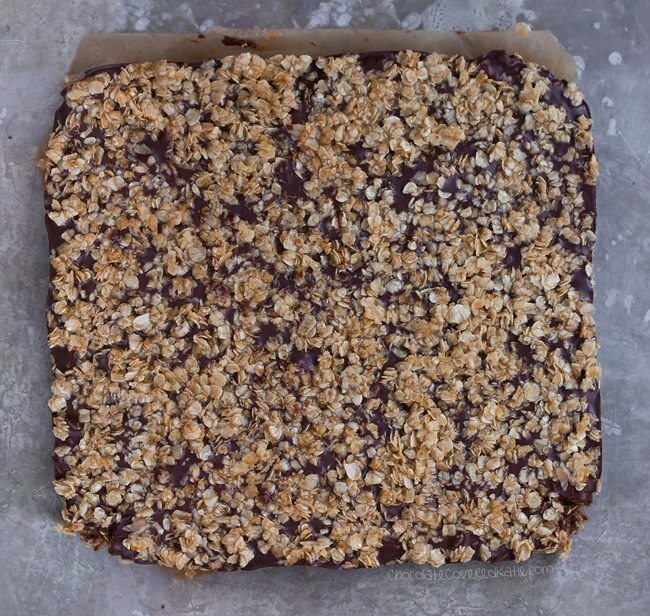 Oatmeal fudge bars have been a favorite potluck recipe for generations, but just because they contain oatmeal does NOT make the standard version of these treats a healthy choice. 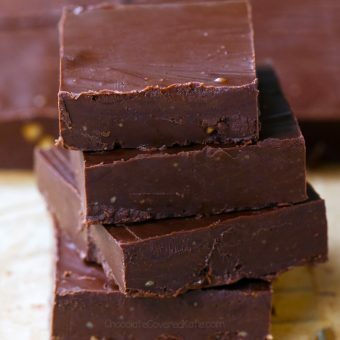 Many oatmeal fudge bar recipes–including copycat recipes you can find online for the famous Starbucks oatmeal fudge bars–contain a shocking amount of butter and sugar even by traditional dessert standards! 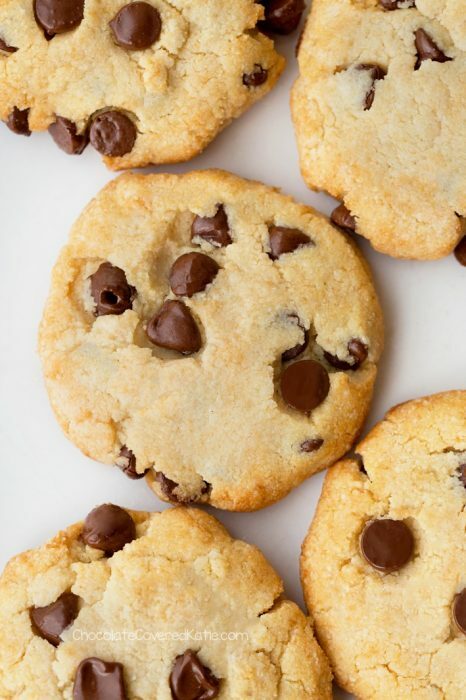 Think 1 1/2 cups of butter, 2 cups of flour, and an entire 2 cups of sugar, not to mention all the sugar from 2 cups chocolate chips and a can of sweetened condensed milk. 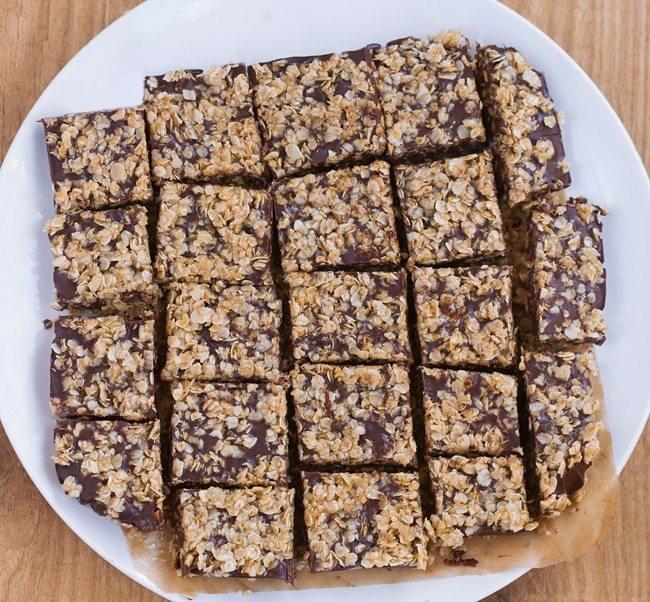 If any recipe were screaming for a healthier makeover, the traditional oatmeal fudge bar would be it. With so many facets of the original recipe needing an update, I opted to throw the traditional recipe out the window and start completely from scratch. 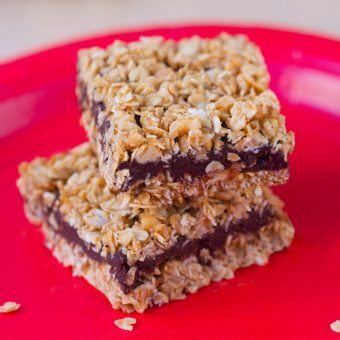 These lightened-up oatmeal bars are flourless, vegan, and just as deliciously chocolatey as the original version! 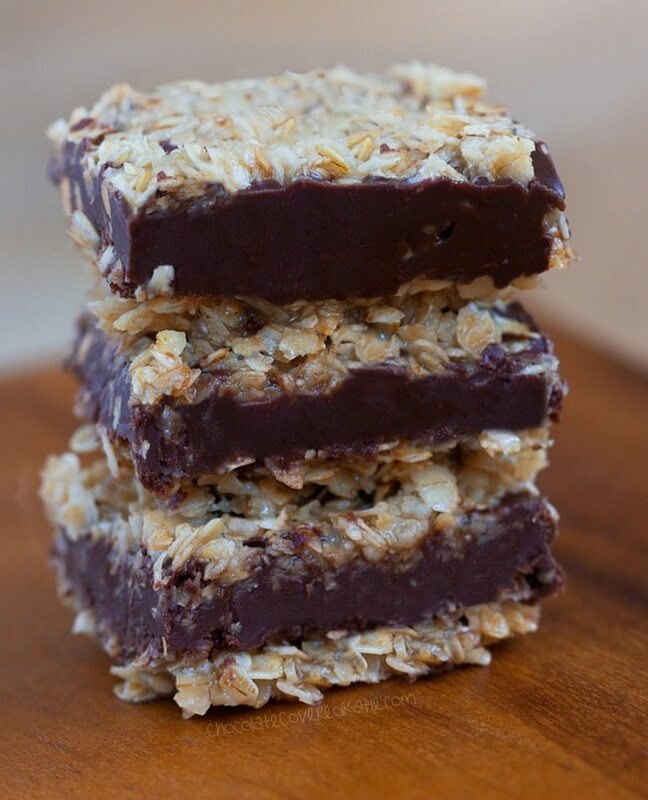 If you’ve never had an oatmeal fudge bar before, imagine eating a homemade oatmeal cookie sandwich with a layer of smooth chocolate fudge in the middle. That’s pretty much what this recipe tastes like. Oh! Except I forgot to mention the BEST PART!!! 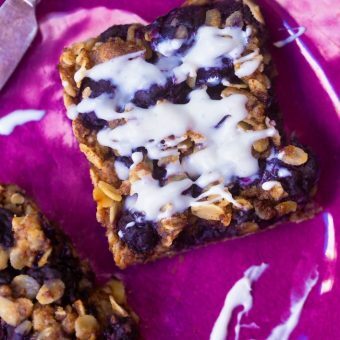 Instead of using any oil in the recipe, I made these bars even more delicious by adding peanut butter! Basically, they contain all my favorite foods in one hand-held dessert! If you are not a peanut butter addict like I am, you have many alternative options for these bars, including almond butter, cashew butter, coconut butter, or even sunbutter. *If you want a thicker chocolate layer than the bars in the pictures, feel free to increase the amount of chocolate chips. Line an 8×8 pan with parchment or wax paper, and set aside. Stir together the maple syrup, 1/4 cup peanut butter, water, and vanilla until smooth. Stir in the oats and salt. Transfer about 2/3 of the mixture to the pan, and press down very well, using a second sheet of parchment to press it evenly into the bottom of the pan. In a separate bowl, carefully melt the chocolate and 1/2 cup peanut butter. Stir until smooth. Pour this evenly on top of the crust in the pan. 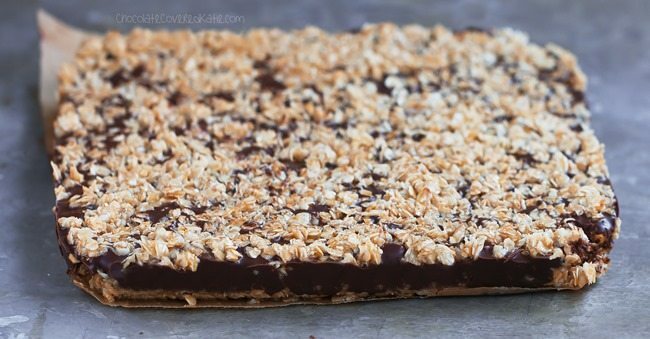 Sprinkle the remaining oat crumbles on top of the chocolate layer, then press down. 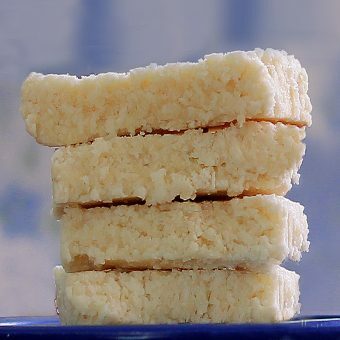 Refrigerate or freeze until firm enough to cut squares. 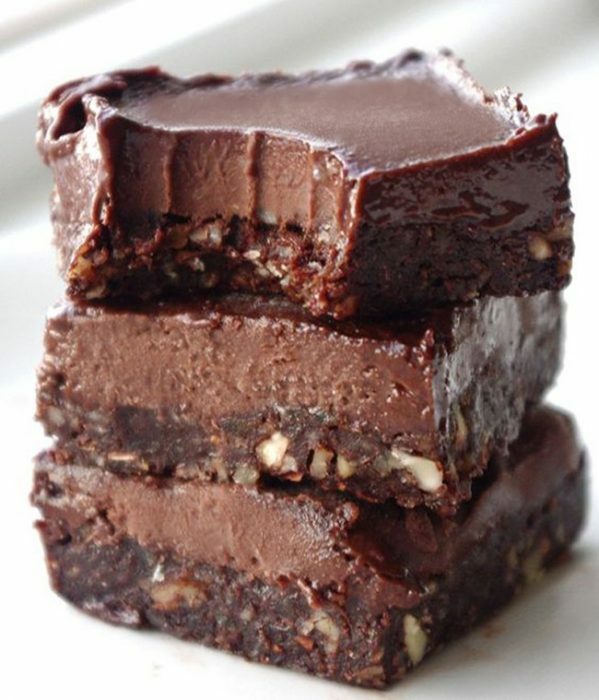 TWO Ingredient Chocolate Fudge Bars! These look so good! I just happen to have all of the ingredients at home! Those are all the best ingredients 🙂 These look amazing! I am concerned about the amount of maple syrup, which is 1/2 cup. Can you lessen the sweetener? I have diabetics in my family. 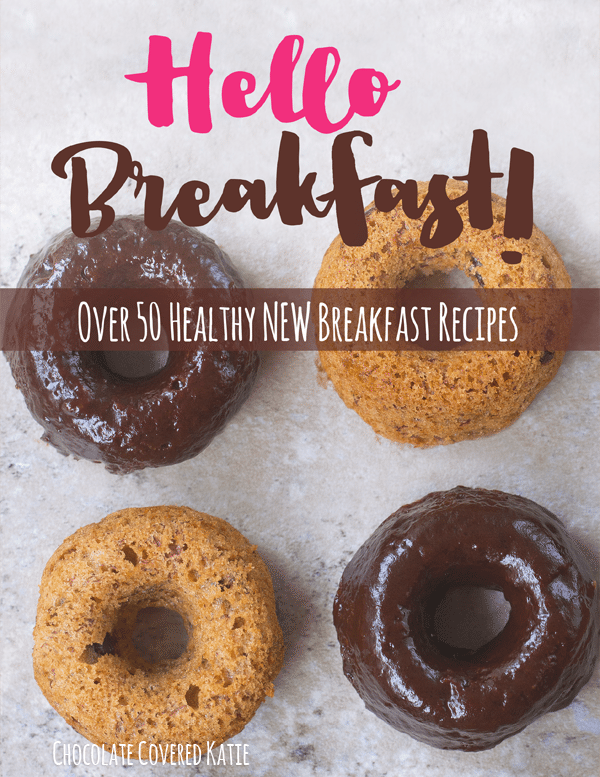 I substitute NuNaturals Simple Syrup (it’s an awesome stevia syrup) for the same amount of maple syrup in these recipes. Nunaturals also makes a chocolate syrup which is great too! I make sure I never run out! Just Google it and you will find plenty of places to buy. The chocolate syrup is the best! Hi katie. About how much (measured) melted chocolate is there in this recipe? I don’t use chocolate chips (*gasp*, I know), and am wondering if I can use melted oil with Cocoa powder in a pan. It wouldn’t be oil-free, but I don’t mind. Thanks! I’m sure your coconut oil idea should work. But the only measurement I took for the chocolate is the 4 to 5 oz. Be sure to report back if you experiment! These look incredible! I love the combination of oatmeal and chocolate! Katie – did you happen to try this with regular oats vs quick? My store doesn’t carry quick oats that are gluten free. I was able to successfully sub regular in your black bean brownies but I’m not sure if that worked because the oats were both ground and cooked in that recipe. I need to recreate these they look so absolutely delicious!! Forgot to mention, we used almond butter and it worked great. Thank you for this! Our oven is broke and being poor college kids we have been doing everything “no bake” until we move out in May. Can’t wait to make these! Perfect timing.. I was thinking about what mid-week treat to make to get us through until Shabbat. As I am grain-free I will adapt your crust to a nut-based instead of oatmeal based; should work fine. Ohhh.. I am excited! Oh. Wow! I am speechless! This is something that I will be making with the block of chocolate that I have in my cupboard. Yummy! I’ve not tried so I really can’t say. But be sure to report back if you experiment! I use NuNaturals Simple Syrup in these recipes instead of maple syrup. It works great. recommendation are great too :D)? Alternatives to peanut butter that will work include almond butter, cashew butter, sunbutter, or even coconut butter. Can I use something that is not butter or just a little nut butter and something else, but what? I also wish there was something to use instead of a butter – my daughter is allergic to peanuts and almonds and I hate the taste of soy butter. I think I’ll try your bananas suggestion, how can you go wrong combining bananas, oatmeal and chocolate? ! I made these with tahini and they were awesome! 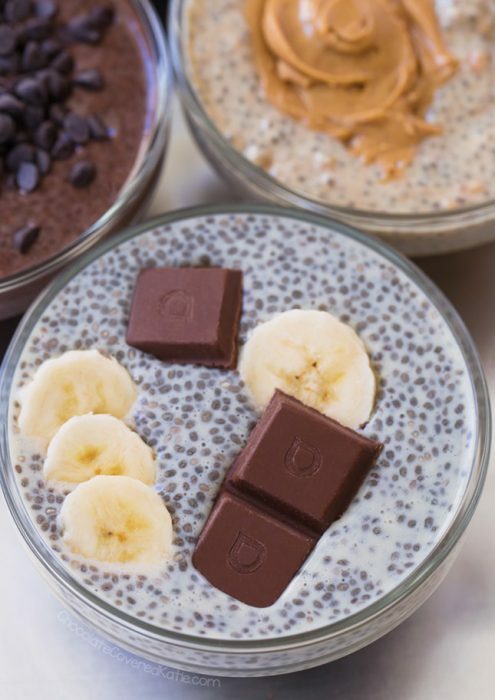 Have you tried sunflower seed butter? It’s SO GOOD and I use it a lot in place of nut butters when baking to accommodate a friend with an allergy. I used specaloos cookie butter. It makes it not as healthy, but the consistency is similar. I am late to the party but have to say THANK YOU!!! We use the Specaloos as a treat in our house. I will be using it in these occasionally. Great recipe. Simply simple. Looking forward to trying it. I don’t blame anyone who went crazy! 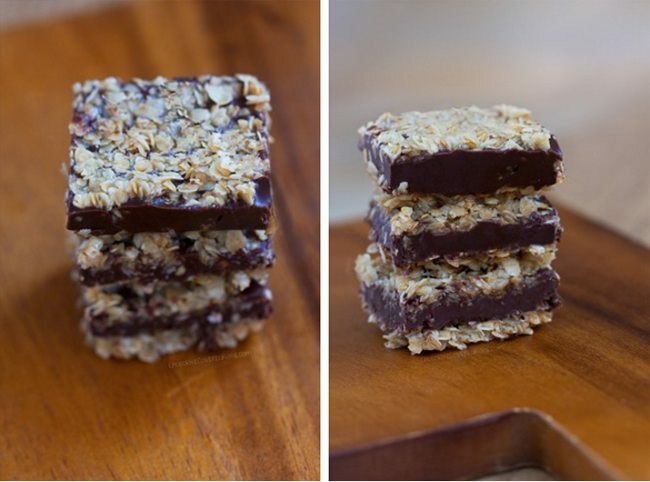 These bars look stupendous! 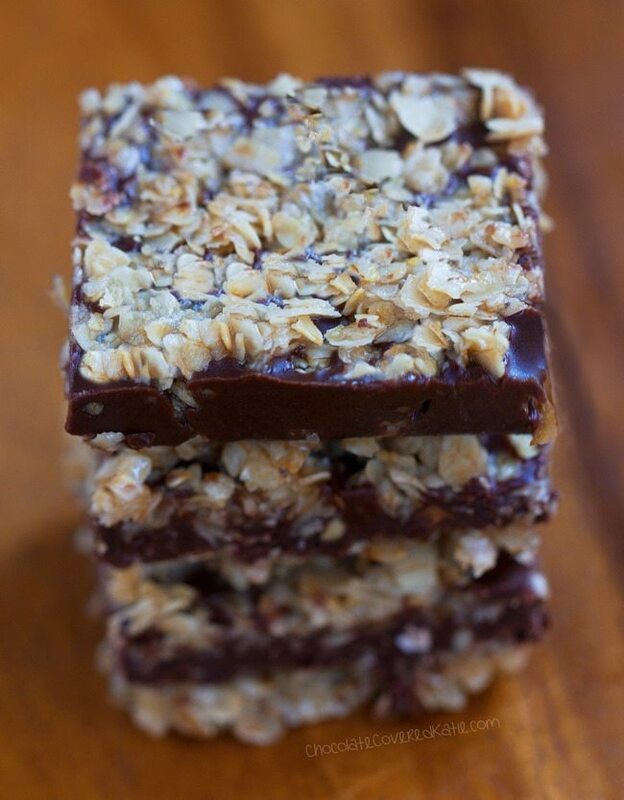 Peanut butter, chocolate and oats are the perfect combination! Oh yes, I am definitely making these tonight!!! Yummmmmm!!!! !